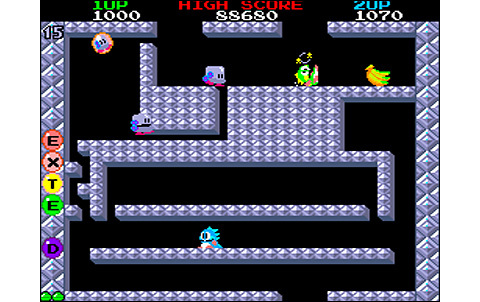 In the beautiful world of 2D video games, dthe platformers are divided into two categories: those with a loaded pistol, and those who dig. Oh no sorry, that's not now for this sentence: there's games like Mario and Sonic, with multi-directional scrolling action, in which we explore sometimes labyrinthine levels and usually face Bosses, at the end of each world. 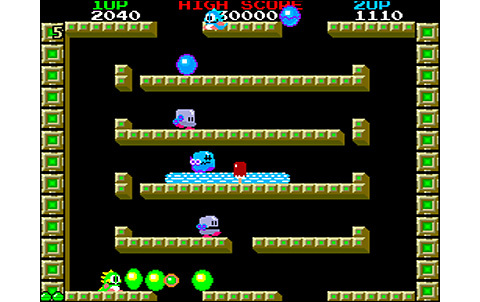 Bubble Bobble simply created the second category. 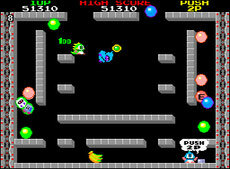 It's always about climbing platforms and killing enemies, but in fixed screen stages. 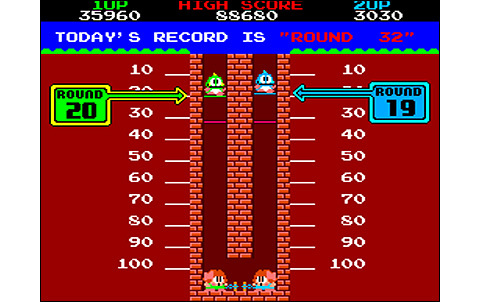 The gameplay differs significantly, because it is juste about "cleaning" each level incidentally by making the maximum amount of points. 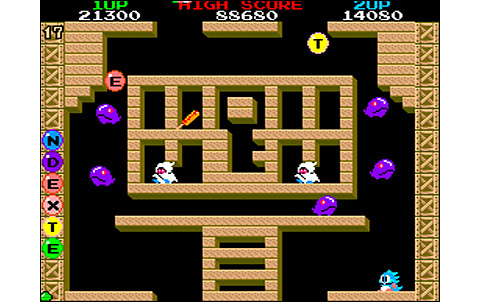 Proposing a taking two-players cooperative play, a lot of fun and an instant grip, this game of Taito will become a total hit in the eightiers: not only is it perfectly suited to the "arcade" format, but its various adaptations and episodes will encounter great success on almost every home system. Indeed, our little dinosaurs Bub and Bob are the actors of a new king of video-game, with very simple concepts. The fiancees of our friends were kidnapped by the wicked Baron Von Blubba, and we will have to go down no less than one hundred stages underground to find them. Each room consists of our heroes who are locked in a screen with platforms, passages from top to bottom and vice versa, and a whole lot of enemies. 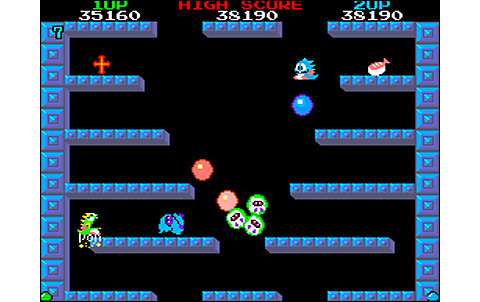 To go to the next stage, you have to blast them all with yur bubble and make them explode. By the way, don't forget to pick up the various bonuses (score, power up, special attacks, speed up, etc ...) that will come to you. 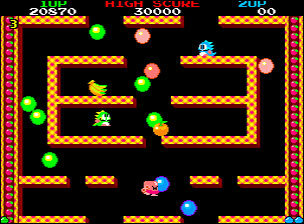 With the A button, you launch a "capturing" bubble: if you aim correctly, it traps the enemy. You just have to jump or step on to burst it. Button B is used to jump, and that's it for the controls! Note that it is impossible to go down from higher platforms other than going after them. Usually in more recent games, this maneuver is possible with down+ jump button. 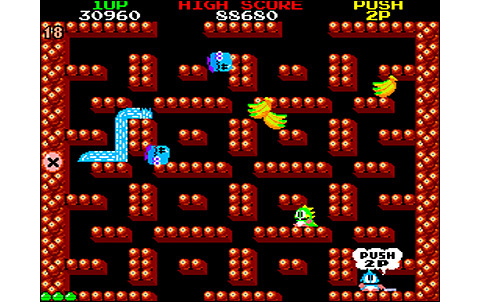 The difficulty is gradual, pretty fair at first, but we quickly realize that some advanced levels are particularly hard. 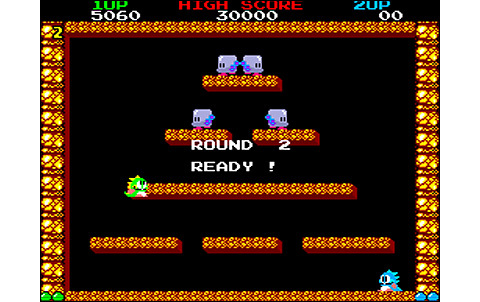 You will need practice and an advanced dexterity to overcome some rounds, even with two players helping each other. The enemies are more and more formidable and numerous, and the configuration of the platforms is sometimes tricky, which does not facilitate things. But what is really good is that by collecting the right bonuses, our dragonlings will gain a few special attacks: spitting fire, electric lightning and water wave. It is possible to increase the moving speed of our characters by collecting the speed-up item. 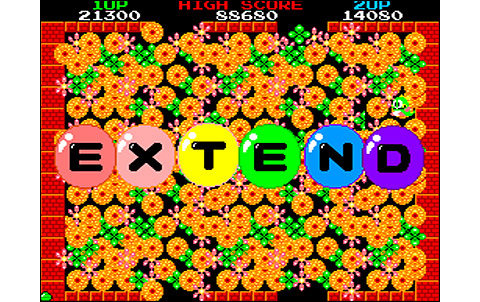 We must also think about getting the letters to get the word "EXTENDED" completed: once it's done, theis will provide an extra life. 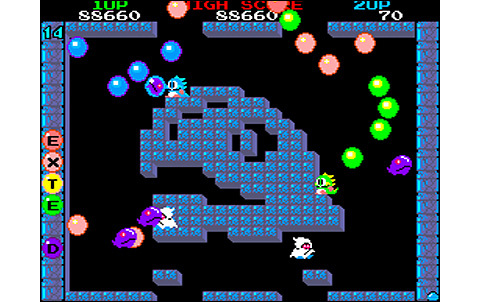 On the other hand, if you manage to kill all the enemies of the level in one shot, that is to say by managing to gather the bubbles to burst them all together or with the water wave well placed, a huge bonus will fall from the sky ! And the score is not there just to look nice: every two hundred thousand points, you are rewarded with an extra life. 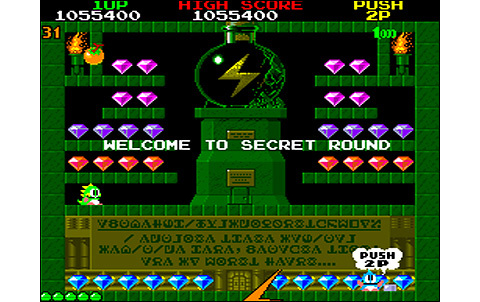 To resume all these features, the challenge is very interesting for seasoned players, because if you play well the scoring race for the 1up and Extended, and you understand the good strategies to overcome the hardest levels, then clearing the one hundred levels is totally do-able within a single credit, in pain I grant you, but feasible. 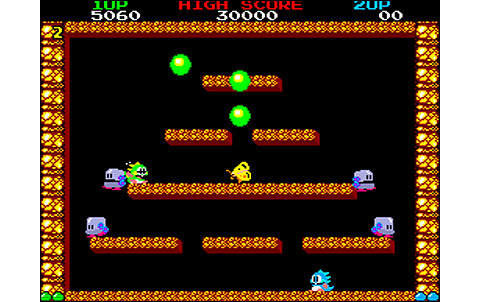 Bubble Bobble is full of little surprises that add to the fun, like the hidden stages in which you get some bonuses, the storm of giant lightning triggered with the cross that we pick up at times, or even the unexpected "time warp", a magic umbrella that have you jumping forward several levels. There is only one Boss, the Ending Boss, but the fight against this one is pretty tough. 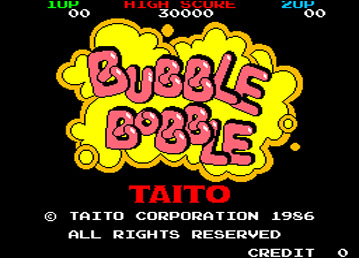 And since Taito was not sure that you would have had enough, to see the real end of the game, you'll have to finish the game twice ... if you played alone! LOL! Ah we've already been through this kind of jokes, with games like Ghouls'n'Ghosts, Last Resort, King of the Monsters, etc etc ... But rest assured, you will have only the last fifteen rounds to do again. Just think of playing two at least against the final Boss and you'll be done once and for all! In 1986, the variety and fine line of BB background are really gorgeous. 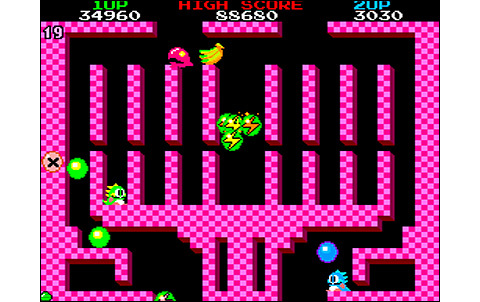 The pace of play is ideal, animation very smooth and there are no slowdowns, even when the screen is loaded with bubbles and enemies. The main (and only!) theme is pretty nice, and it accelerates when the alloted time is coming to an end, just to provide some stress! 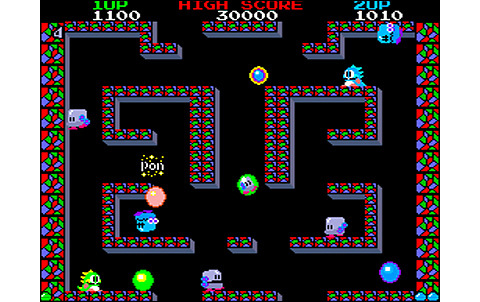 One hundred screens to clear, with a few that are literally puzzles, plus the two-players play. 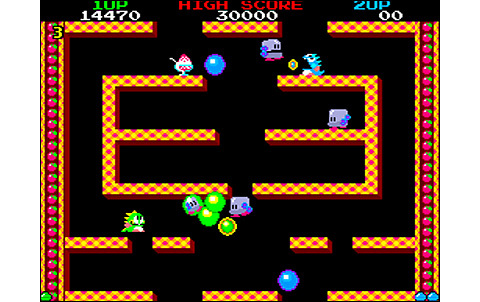 Bubble Bobble is really long and taking, and you come back to it willingly. The concept is incredibly simple... and perfect! 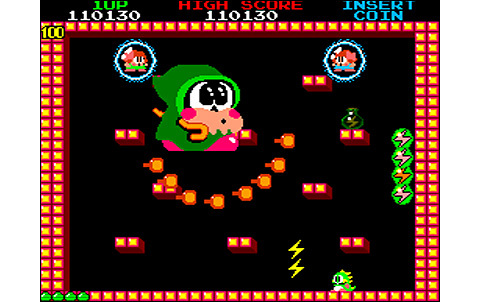 The gameplay is great right from the beginning, and Taito even introduced some bonuses and strategies that make the action even more enjoyable. A Treat! 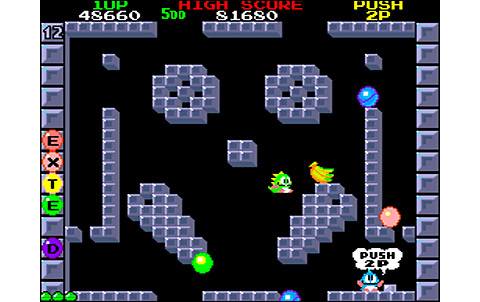 Bubble Bobble is a timeless game, a monument of video-game. 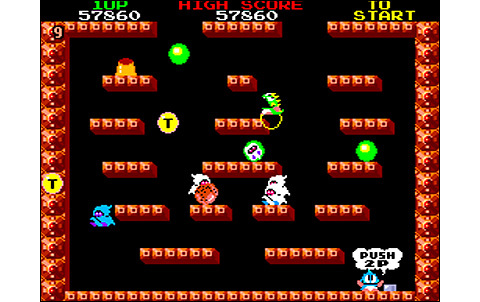 SNK's machine hosted only three of these platform games, which are Bang Bang Busters from Visco, Nightmare in the Dark from Gavaking, and Zupapa! by SNK. All of them are really good and deserve to be played, if you liked the legendary Bubble Bobble.